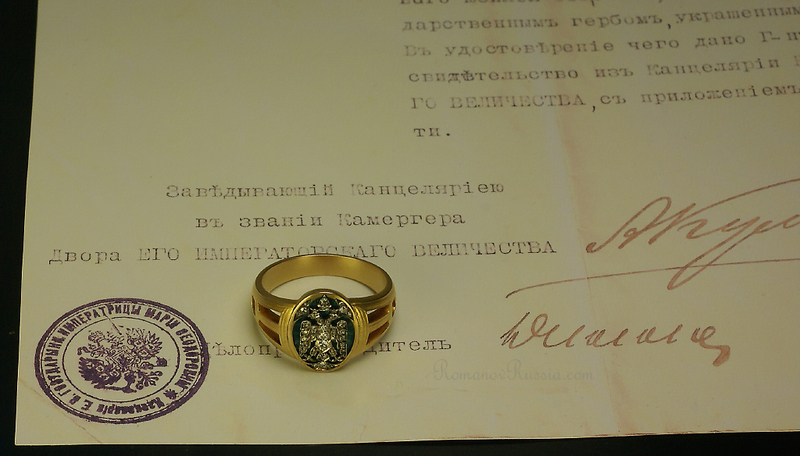 This Friday we will look at a piece of man-jewelry - a Russian Imperial Award Ring given by Empress Maria Feodorovna to an unknown man, in 1915! 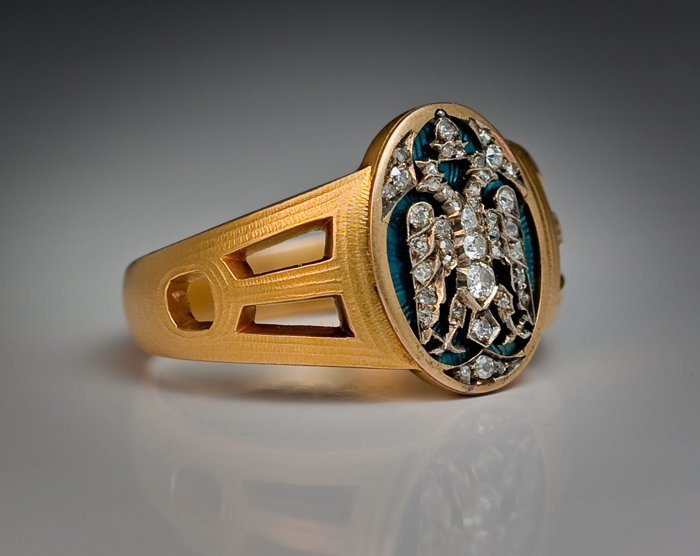 The ring is made of gold, with a matte finish, gray guilloché enamel, and diamonds. 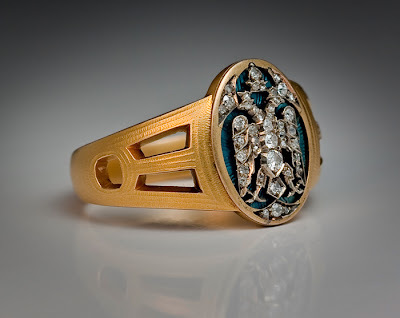 It is designed in the Russian modern style of the 1910s, with a medieval version of the Byzantine double-headed eagle. After the Byzantine empire had fallen, in the 15th century, Russia adopted the double-headed eagle as its state emblem. The design of this emblem was changed several times over the following centuries, but in the 1910s the medieval version was brought back in the decorative arts. 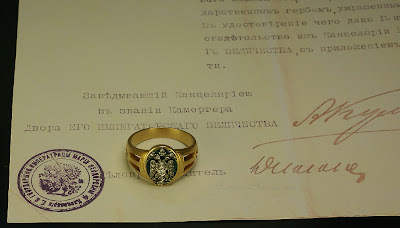 The ring comes with a copy of its original award certificate, signed by the head of the Cabinet Chamberlain of His Majesty's Court, and stamped with the ink seal of the Cabinet of Empress Maria Feodorovna. 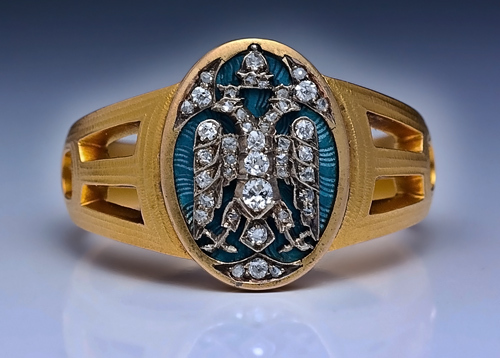 Compared to most of the other Fabergé items I have written about, this ring can be yours!!! For the petite sum of 125,000 USD! If you're interested, just follow this link to the web site Romanov Russia! This is utterly incredible Miss Meadows, an absolutely wonderful present for anybody to receive and it's so cool that it's around nowadays for people to see, absolutely beautiful, I'm in love with it! Wow, such a luxury peice of ejwellery! I love jewels, that have a story and a history. Just came over from Kizzy and am a new follower of your blog - want to follow me too? I'd like to invite you to my giveaway - a pair of chic eyeglasses - come and have a look!